12th May to 8th July 2018, Wed-Sun 10am-5pm, FREE. Mutsugoto is a prototype body-drawing communication device intended for people who find themselves in long distance relationships. It allows partners to communicate through the language of touch as expressed in light on the canvas of the human body. 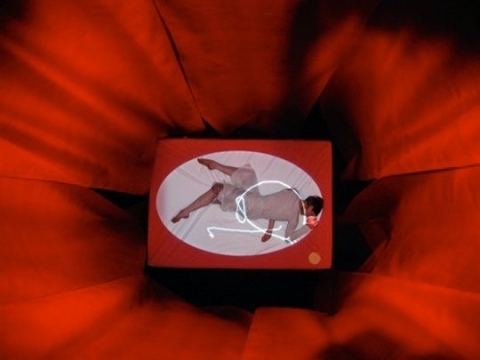 A custom projection system allows the two users to draw on each other's bodies whilst they lie in bed. Drawings are transmitted live between their two locations, enabling a different kind of communication that leverages the emotional quality of physical gesture. In 2009 we installed two Mutsugoto rooms, one at the CCA in Glasgow and the other at a secret location in Scotland. The two rooms were used for a game and a networked dance piece by Sue Hawksley, performed to music by Peter Gregson. The game was to find the secret room. 5th August to 5th September 2009, Wed-Sun, 10am-6pm.